This week’s monster hails from the classic arcade game of the same name. 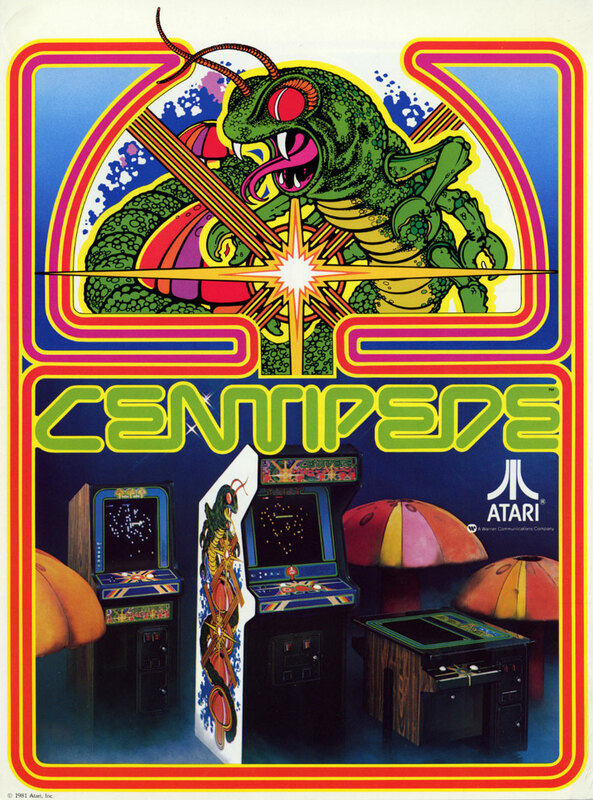 Released in 1980 by Atari, Centipede ranks as one of the best-known games of that early arcade era. Maybe you remember it because you were there, maybe you need to hunt down a decent barcade or internet copy for a refresher course – but it’s one of the earliest video game monsters there is, so Bowser and co can wait until our many-legged friend gets its due. Here’s the setup: Centipede puts its player character at the bottom of the screen. The titular baddie appears at the top of the screen and works its way down towards the player row by row. Your goal is to blast each of its segmented bits to smithereens before it gets to you. The basic gameplay is a little bit like Galaga. Sounds pretty simple. Here’s the catch: shoot the middle of the centipede, and it splits into two smaller ones. That’s true for a centipede of any size – so unless you get very good at shooting the head or tail end, your enemies will end up multiplying pretty fast. To make matters worse, the second level throws an extra super-small, super-fast head-sized centipede at you. The number of disembodied headipedes goes up with each level you beat. As you can imagine, it can get overwhelming pretty fast. That’s all you really need to know to play the game, though. Oh, sure, every once in a while it’ll chuck a lesser bug at you just to throw you off, but the rules of the game never stray from what’s established in level one. Some games increase difficulty by adding variations on the existing rulesets – an enemy that moves in a different way, for example, like the knight in a game of chess – but Centipede is not one of those games. In Centipede, the name of the game is more and faster. Now, if we were all Vulcans or computers, it would be pretty simple to get around that. All you have to do is come up with one strategy! Just increase speed as necessary. Logical. But, uh, we’re squishy, irrational, emotional humans. We are not logical – at least, not past a certain point. That’s what Centipede is counting on, and that’s where the game’s tension comes from. We all have a breaking point. Go ahead – give it a try! Maybe you get the hang of it and blast up a few centipedes. But eventually, you’re going to screw up, and all those little quick-moving pieces will overwhelm you. Centipede’s tension comes from making us panic. Really, go take a look at that game. This is a blog about monsters – and usually, or at least often, we think of monsters as scary. Centipede is not scary. I mean, okay, maybe that pixelated little avatar scares you or creeps you out a little. I’m willing to bet that’s your imagination, some primal fear of the real flesh and chitin critters that the pixels are standing in for. Don’t get me wrong, using a symbol to tap into coded emotions like that can be a really powerful tool, but it’s not the primary tool at work here. It’s not really fear — it’s anxiety. Tension. You’re on the edge of your seat because there’s an undesirable outcome that’s inevitable unless you take action to stop it. And you need to take constant action. You need to be attentive, precise, and fast. Will you be able to do it? It’s an unresolved question, and here’s the terrible beauty of it – it can never be resolved. The game goes on forever. It goes on until you die. You could argue that, actually, that answers the question right there – no, you will not be able to do it. You will ultimately fail because that’s the way the game was programmed. It’s predetermined. The only way to win is not to play. But that’s opting out of the game entirely. And, uh, it’s not a very fulfilling life philosophy. I wouldn’t recommend it. The point is that if you opt into the game at all, you’ll be faced with that question constantly, in real time, as long as you’re playing. It only becomes more urgent the more the game throws at you. Emphasis on you, by the way. No, not you personally, you vain reader, you! I mean the general you – the player. Every type of media brings its own advantages and disadvantages to the table, and for video games, the big advantage is investment. Video games have an advantage over books, movies, or, dare I say it, even this blog – because you have an avatar in the game that you control. You’re projecting your sense of self into the game world. By proxy, the centipede is actually attacking you, which heightens your investment in the game and therefore the anxiety you feel as it creeps its way down to smoosh you under its one hundred tiny feet. Yeah. Not your best day ever. So, what’s the verdict? If the centipede isn’t scary, is it still a good monster? I say yes – because Centipede isn’t designed to be scary. It’s designed to be fun, engaging, or even addictive, and it is. The centipede in the game fulfills its purpose of keeping the player on edge. Fear and anxiety aren’t quite the same thing, but they’re damn close. Besides, the game is classic for a reason. It’s hard to put down. What do you think, does Centipede hold up after all these years? Does the little creepy crawly keep you on edge? Drop by the comment section!